Bibs are the greatest aren’t they? The catch drool,spit up, food and everyday baby stuff. If you were like me, I went through a lot of bibs in a run of a day…and all the ones I had had to be machine washed. BabyBjorn makes a soft bib with an ergonomic design, a soft, smooth neck line, adjustable closure, deep catch all pocket, flexible material and easy to rinse clean. 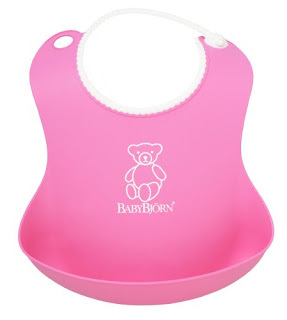 So when you are starting baby’s first foods which we all know can be MESSY all you do is rinse the bib clean and its ready to go for the next meal. I love the way it feels. Its super soft and flexible so it moves with your child. And I loved how it caught the food in the pocket before it fell to the the floor.